The Glass House provides a complete service in your home. 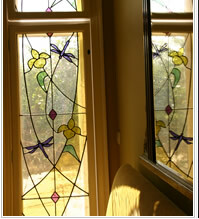 Bryony will meet you to discuss your requirements and then will design, produce and fit the glass. At every stage she keeps you involved and you can have as much or as little input into the design as you wish. In this way you get a product that is personal and unique. back lit glass wall art. Each piece is made by hand with the finest quality materials. If you would like an individual, exceptional and beautifully made focal point for you home, using our talent, experience and skill we will create glass work that you will love.